In real life, an A4 paper is smaller 24=16 times compared to an A0, or 6.25% of A0 size. 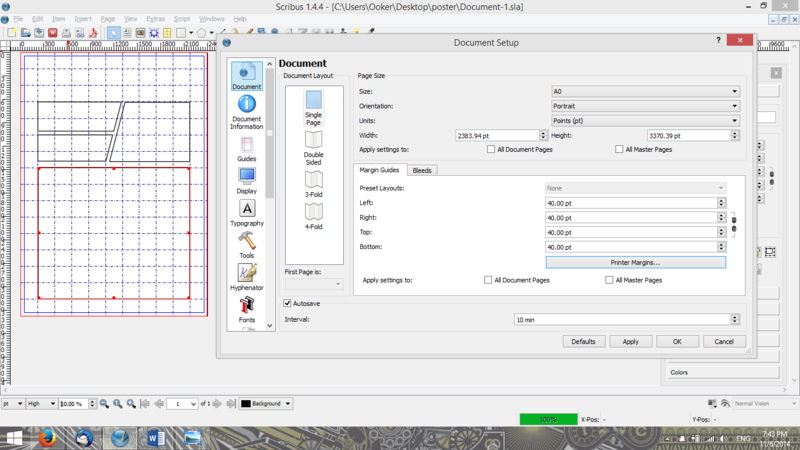 When I start a new document in Scribus with the size A0 and set the zoom to 10%, in theory it should be larger than an A4. In reality, it is like an A7. Can you explain what's happened? Related post: 100% view is not 100%? In real life, an A4 paper is smaller 24=16 times compared to an A0, or 6.25% of A0 size. When I start a new document in Scribus with the size A0 and set the zoom to 10%, in theory it should be larger than an A0. In reality, it is like an A7. Can you explain what's happened? a7 should be an a0 format scaled by something between 8 and 9%. oops, I'm so sloppy. I mean when you scale it to 6.25%, the size in the screen should equivalent to a real A4 size. Are you talking about putting a ruler to the screen and measuring the size of the displayed 'page'? If so, that would very much depend on the size of your monitor, the display settings and the number of pixels per inch that the monitor shows. If you need "actual" size on the screen, you would have to play with the zoom setting. Start with 100% zoom. If it isn't accurate, adjust the zoom setting until it matches an actual ruler. when you scale it to 6.25%, the size in the screen should equivalent to a real A4 size. now i see your point – and what you're mixing up. scaling to 50% will shrink a line to half its length. but for an area it will be a quarter.